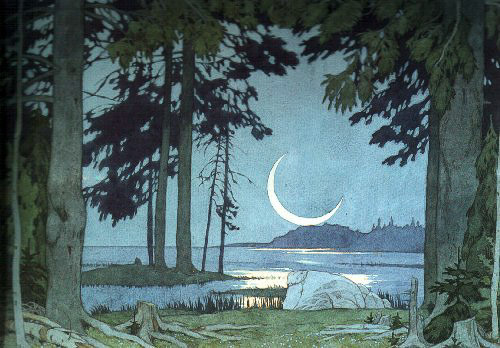 It came to me last night that the crescent moon is featured in a couple of my favorite illustrations by Ivan Bilibin (1876 to 1942). 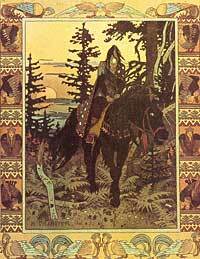 Bilibin is best known for his illustrations of Russian folk tales: The Tale of Tsaravich Ivan, the Firebird and the Grey Wolf; Vassilisa the Beautiful; Vassily the Unlucky; The Tale of Tsar Saltan. Many of the illustrations are bordered with simple graphic motifs that recall the Russian folk genre to which they belong. Bilibin was also a noted stage designer whose portfolio included stage designs for the 1909 premiere production of Nikolai Rimsky-Korsakov’s Le Coq d’Or. However noteworthy are his larger works, I’m attracted to some of his smaller illustrations featuring stark Russian landscapes that serve as endpieces or the back cover of books. Their simplicity is reminiscent of Japanese woodblock prints. Apart from his work as a illustrator, Bilibin painted scenes from his travels to Egypt and the Middle East. The paintings have a graphic quality often playing light against shadow in stark contrast to his illustrations of the northern Russian crescent moon.